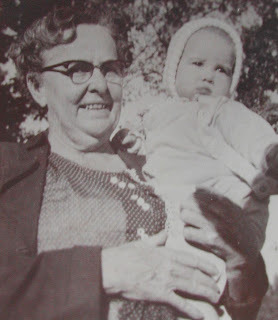 One of the things I remember most about growing up in Alabama is spending time in the kitchen with my great aunts, Ruth and Mamie. There was always something baking. As soon as the last slice of cake was eaten at dinner or supper, another cake was in the oven. Every batch of batter was large enough to save out an extra scoop that was baked in a tiny pan especially for me. On afternoon, Aunt Ruth found an old wood cheese box with three compartments. She lined it with an old grocery sack and poured in the extra batter for my little cake, three cakes this time. I remember those fat little cakes. They were almost too beautiful to eat, but I somehow managed. I hadn’t thought of that cheese box for years until I moved to West Virginia. In the corner of a box of items packed years ago after my great aunt died, I found the broken side of that old box. I began searching for a replacement and several months later, I found the same Cloverleaf cheese box. The day it arrived I dropped everything and stirred up a chocolate cake batter. When I baked my little cakes, a flood of memories came rushing back. This is an easy chocolate cake that comes together in one bowl. It’s quick and easy with little fuss. Bake at 320 till firm in the middle, about 15 minutes. In a large bowl add the flour, soda, salt, cocoa and sugar and wisk to sift the dry ingriendts together. Add the buttermilk, oil and vanilla and wisk the batter till smooth. This recipe will make two layers or about 24 cupcakes. 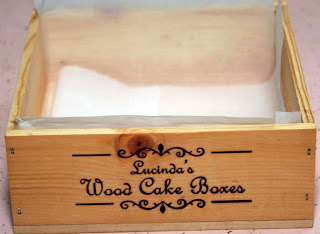 Several friends saw the cakes baked in my wooden boxes and wanted to get their own to bake in so Lucinda's Wood Cake Boxes was born. Fantastic blog! I don't think I've seen all the boxes of this subject the way you've pointed them out. I love seeing websites that realize the value of providing a quality information. Thanks for sharing this! Do you know if there ever was a wooden box just for transporting pies? Your box is very interesting! Great information in your blog! Who knew you could bake a cake in a box?!?... (Not me!!)... Just wondering. Can you bake your One Bowl Chocolate Cake in a wooden cake box?